Intro: The last time I owned a particle thrower that had lights and could vibrate was during the early 2000s. My prop Proton Pack replica and its accompanying wand didn’t have sound. During the 16th anniversary of Ghostbusters, that didn’t matter. I had a real Proton Pack and could become a Ghostbuster once again. Sometime during the early 2000s something went wrong and the pack has never worked correctly again. In recent years their has been a gradual process to repair and restore my pack. Their has been talk of rewiring, it could be costly. When Mattel announced their latest prop toy would have lights, sounds, a motor, and vibrate at a reasonable price, I became intrigued. Because of how they control a collectors market, being “sold out” within days when we all know they aren’t, and the odd shipping company they use I didn’t know if I wanted to go through that again. While I could have budgeted better, with the tax and s/h, Matty Collector was the least expensive to buy the wand from. It’s unfortunate in a way ordering from them comes with risk. Shipping: I know I wasn’t alone with my shipping experience, I appreciate the support group ghostheads have had. 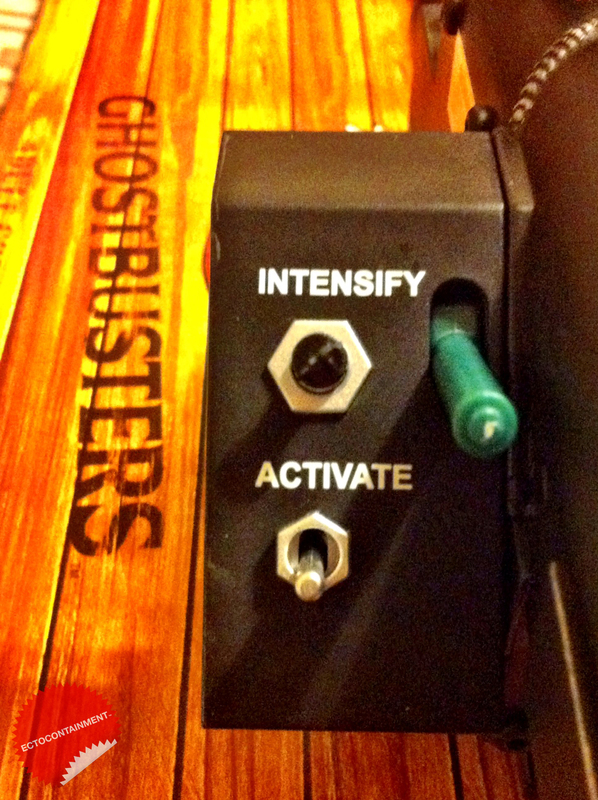 Almost always I’ll order a Matty Collector Ghostbusters toy on the first sale day. I waited until Tuesday, December 17, 2013. I didn’t need it for Christmas delivery and didn’t know I’d still be caught in the holiday rush. I chose UPS Ground over USPS because of the box size and Cornerstone Logistics tracking system. I felt the extra $3 would be worth it. Overnight a UPS label had been created and within another 24 hours, + or – I thought I’d see some movement in their network. I would at least have an idea about when my package could be delivered. The tracking still hadn’t updated, even before the end of the last business day. I was beginning to think the package was still in California. I called “Go Matty” on Saturday, December 21, 2013. At the time I felt the customer service person was about as helpful as he could be. He didn’t really know about the real time tracking, didn’t try to find out about it from anyone else, and I wasn’t issued a ticket number. I didn’t think about the ticket, with the 5-7 business day time frame, taking in account its the holidays, and there possibly had been bad weather along the route, to wait the window out. I was already understanding about that. Being it was Saturday, I really couldn’t do anything until Monday anyway. The wait wouldn’t end until after Christmas, that was me assuming my package definitely went out the previous Wednesday. It was only after that and days before Christmas I found out that UPS and Fed-Ex had more deliveries this Christmas season and wouldn’t necessarily have them delivered in time for Christmas. Personally, I was fine with that. I didn’t blame any drivers, I wanted to have an idea about when my package could be here. On Thursday, December 26, 2013 I called “Go Matty” and spoke to a different customer service person. I don’t know if it’s the norm, I was on hold with epic battle like muzak while he spoke to technical support. In my previous experiences with other companies, I normally spoke to technical support myself. I was suppose to receive an email with real time tracking and the customer service representative provided a ticket number. Whatever the reason, in the 24 hour period from when I called, I never received another email from Digital River. In the end it didn’t matter, what I did receive on Friday, December 27, 2013 was my Neutrino Wand. As I commented on in the Neutrino Wand Poll post as I was coming home from running my errands, I had just slightly missed my regular USPS mail carrier actually delivering a big, sorta long package. I was somewhat surprised and definitely thanked my mailman. It wasn’t until last night I found out the truth about the Christmas journey my Neutrino wand actually took. Most likely because of the volume of packages, UPS worked with USPS to have them deliver it from almost start to finish. It shipped out on December 19, looks like it possibly went to Los Angeles and flew to the east coast. It would have been nice to have known, I’m not sure with the heavy volume who could have provided me with the USPS tracking which appeared to update the entire time. If you read this far, thank you. Cost: The Neutrino Wand costs $130 USD before applicable taxes and s/h. I always felt this price was reasonable for how it functions. Not even counting materials to build a replica particle thrower, light and sound kits can be costly. 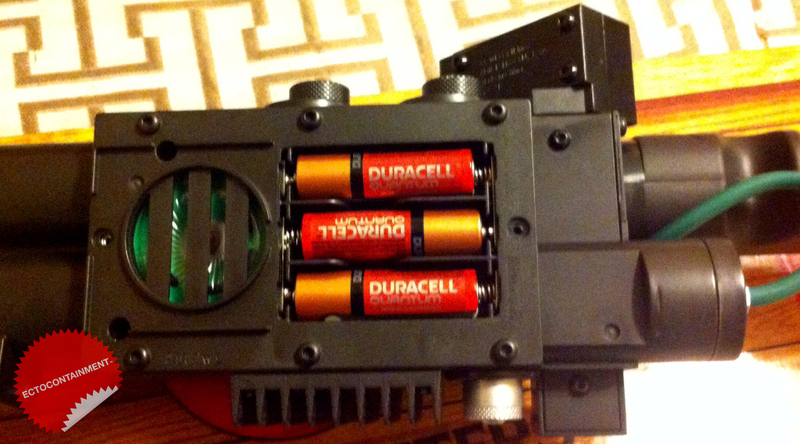 More so when one gets into building a Proton Pack. Of course because of how Mattel controls their base collector’s market, I didn’t want to wait until it was “sold out” or pay secondary/eBay prices. Owning mine for barely a day and going over/through it, the price is fair. Personally it would cost me far more to build one with help or buy one, as I once did. Mailer: Like the previous Matty Collector prop toys, the Neutrino Wand comes in a white mailer with a cardboard tab to open the box. 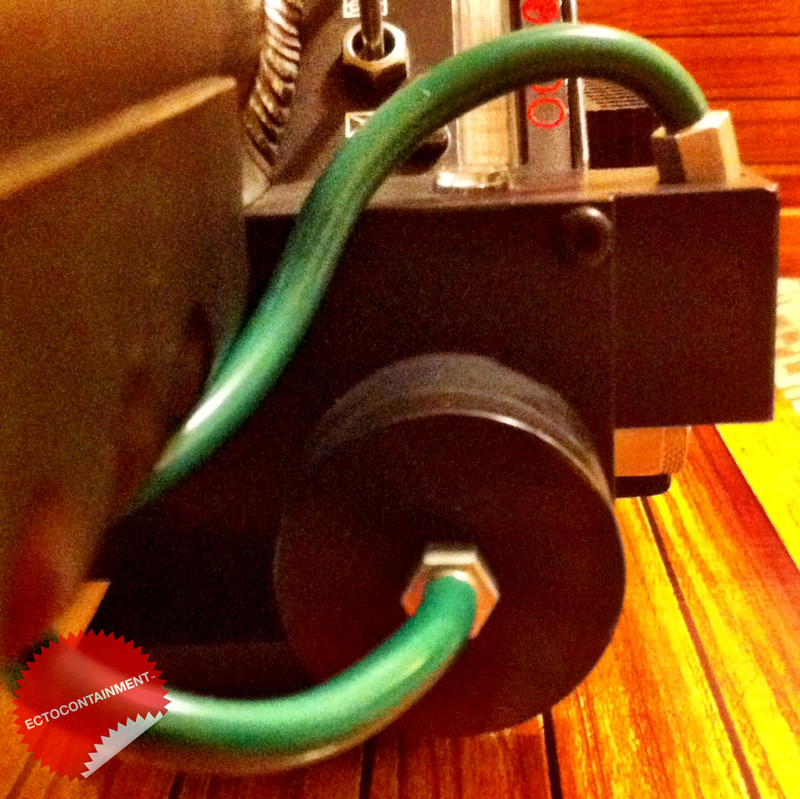 It also has that clear circular tape that can easily be cut. 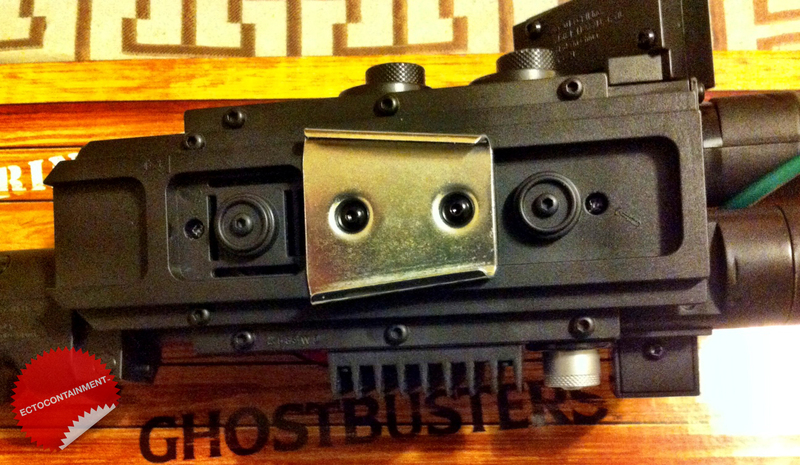 I don’t remember if the Ecto-Goggles mailer had tape too. 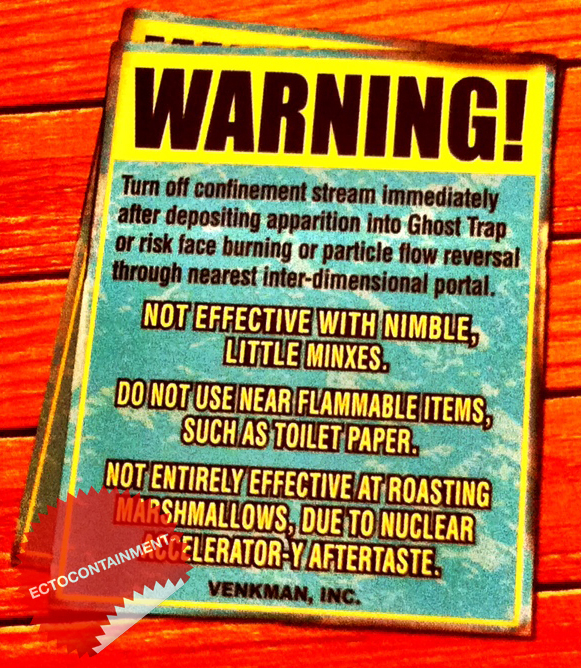 Box: Mattel continues the “crate box” tradition with fun “warning labels.” They either read my Ecto-Goggles review or just got the styrofoam mix right. After I opened the lid, I was easily able to remove the styrofoam without it crumbling. I’ve taken it out and put it back a number of times since. I still haven’t had any problems. 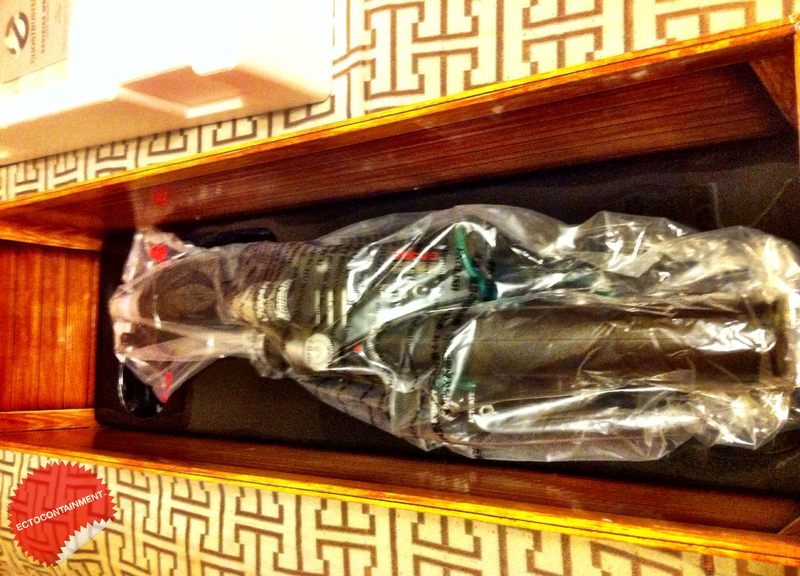 Once the Neutrino Wand is removed from its protective plastic bag, you can see the plastic “mold” that holds the wand in place. I wonder if this imprint came from the press that helped to make the Neutrino Wand in the first place. 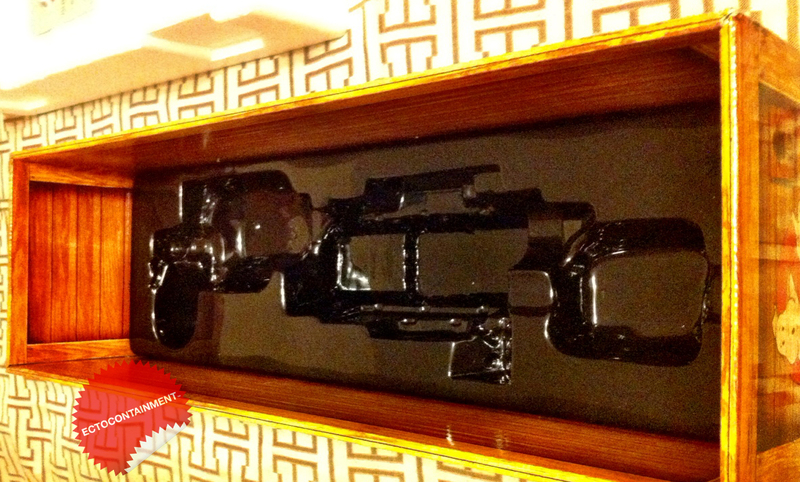 Prop Toy First Impression: I know the replicas Mattel makes are more toys then prop reproductions. I really started seeing them that way with their Ecto-Goggles. 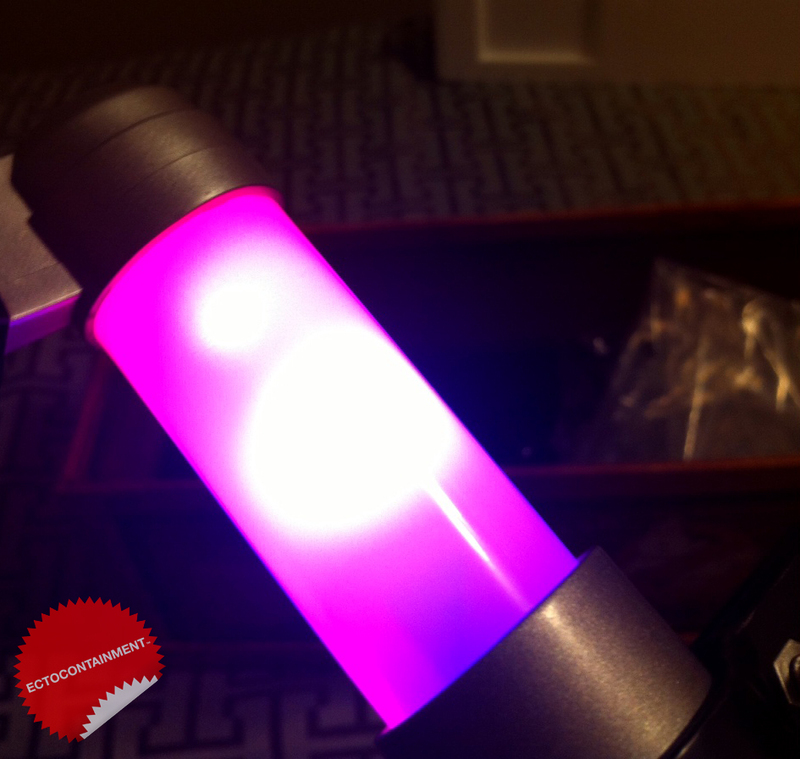 For how the Neutrino Wand (which was approved by Sony) looks and what it can do, its between a toy and a prop reproduction. 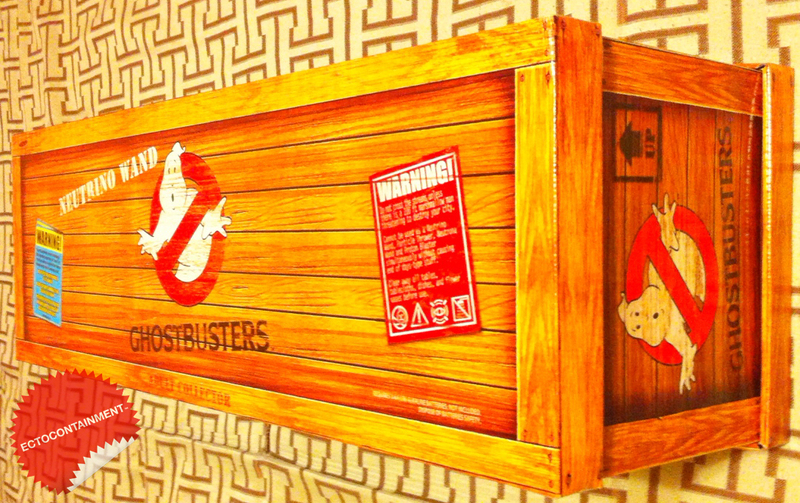 As a stand alone Ghostbusters prop I really like it. When I stopped having fun with it to take pictures and go through it, I began to see what might be imperfections with the molded plastic. Of course if one looks close enough, faults can be found. I don’t want to be nit picky, honest for the product as a fan and to help others who are undecided about buying the Neutrino Wand. I like that the Mattel listened to ghostheads and used the correct color for the wiring. The “wiring” is a flexible, rubbery kind. 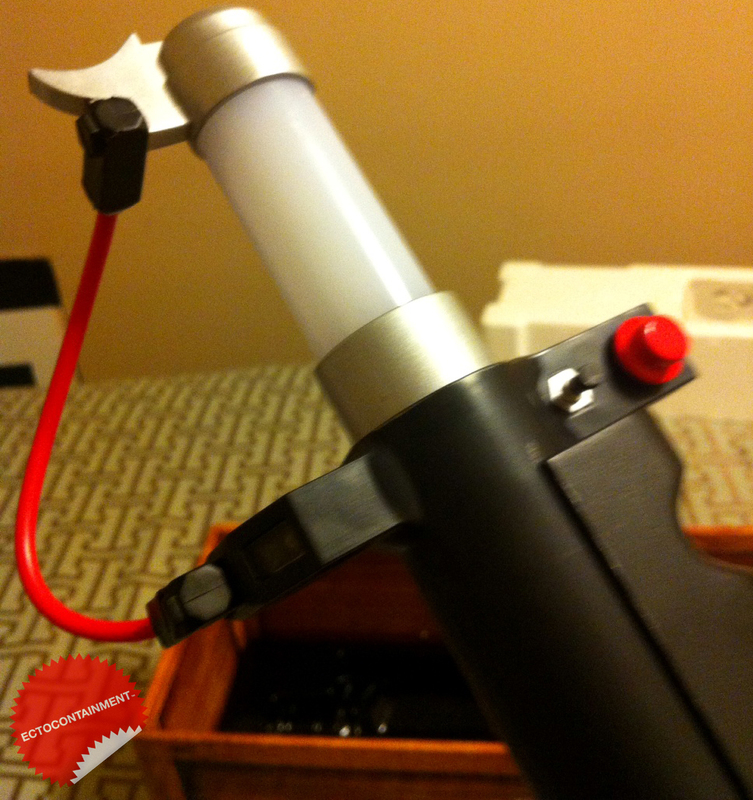 Which seems to be the best way to have made it since the barrel tip extends and the wiring shouldn’t break. 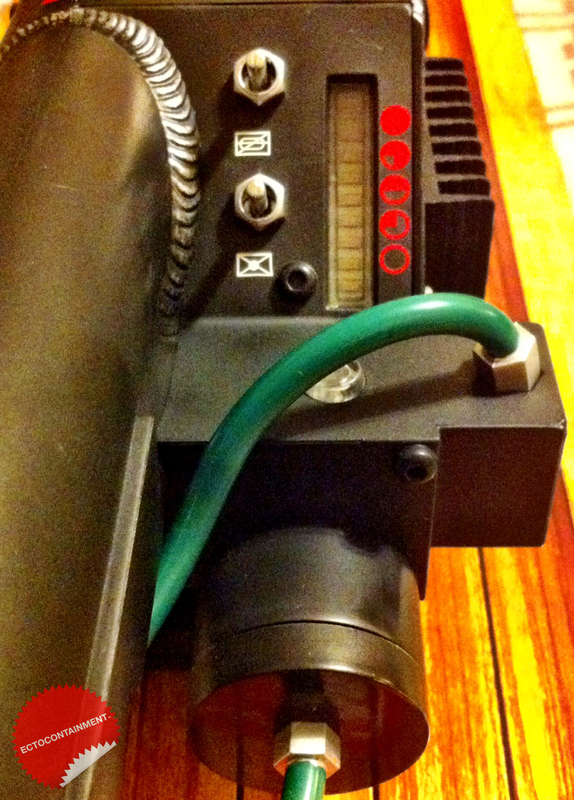 I’m glad Clippard worked with Sony and Mattel to license one of their modular valves. It isn’t exact, the smaller size may fit this particular style. 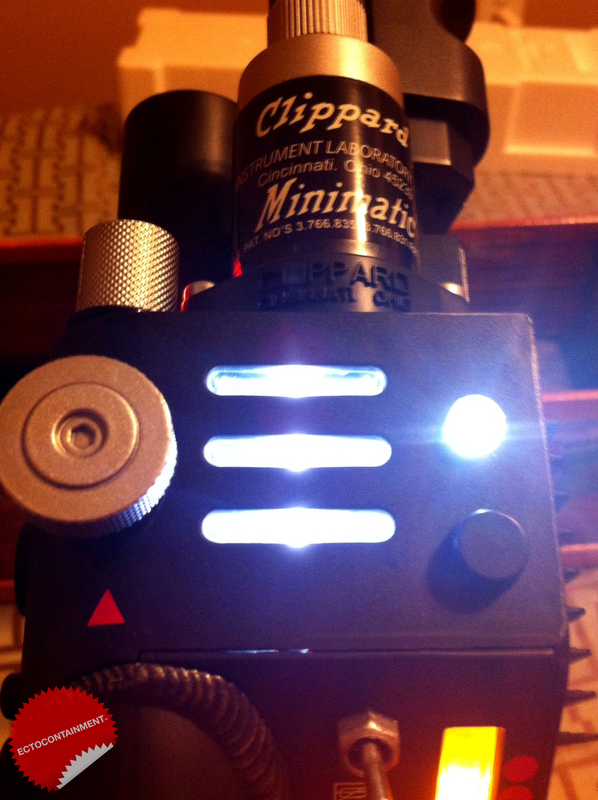 Unlike with the Ecto-Goggles, I’m good with the company applying the different size decals. Less likely to peel off that way. The Neutrino Wand isn’t 100% screen accurate, that may be from certain real parts or having to comply with electronic toy “codes” in Europe. The other inaccuracies ie: different “hat” color don’t bother me. Who doesn’t like fake welds? One of the features when it came to lighting I had been looking forward to is the moving proton indicator. 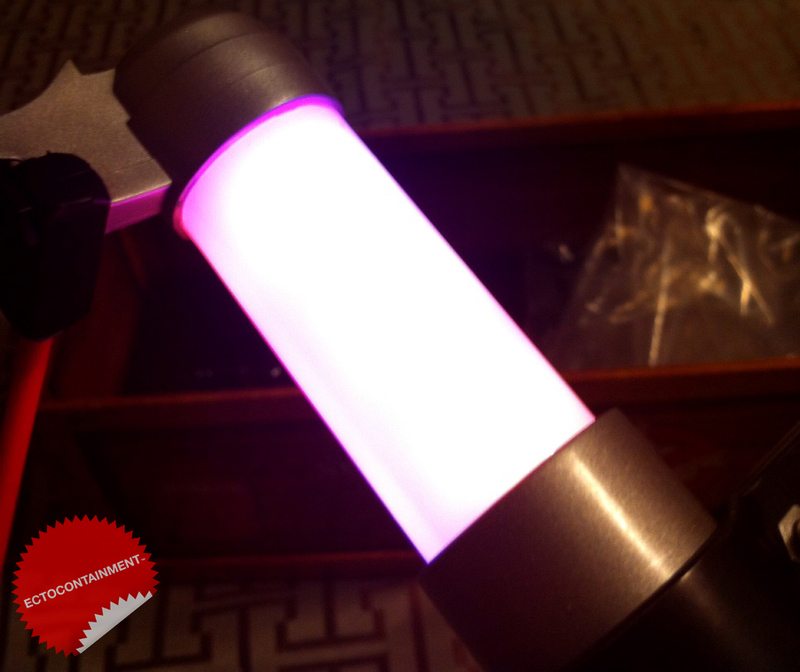 When the Nutrona Wand is powered on and is in use, it moves up and down. Matty Collector/Epic Creations Neutrino Wand doesn’t continue to go up and down like the screen used version. 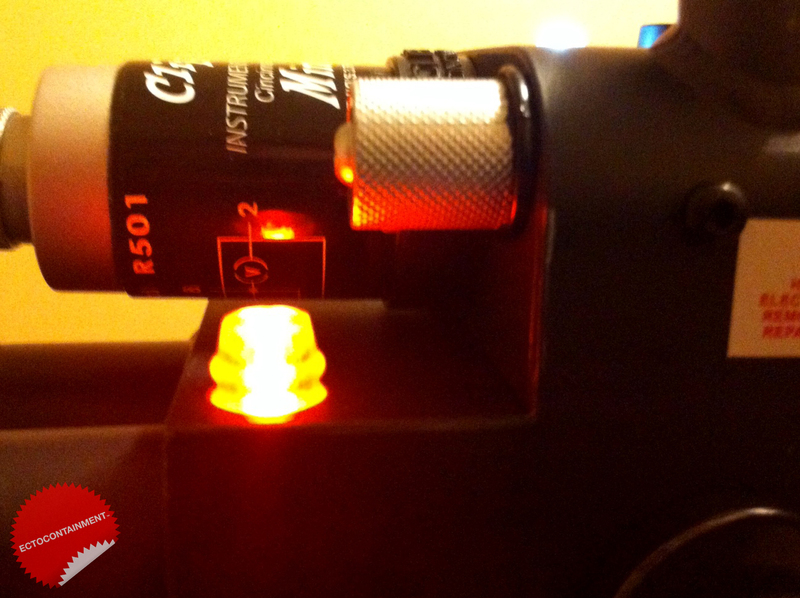 If the stream dial is manually adjusted the indicator will go up or back down. When a ghosthead has stopped firing, the proton indicator “powers down” to almost nothing. I was also looking forward to the vent light. As it makes me think of when Dan as Ray was thinking about total protonic reversal. Unfortunately my particle thrower replica didn’t have lighting in the proton indicator or vent area. Their are many screws throughout the wand for the look. 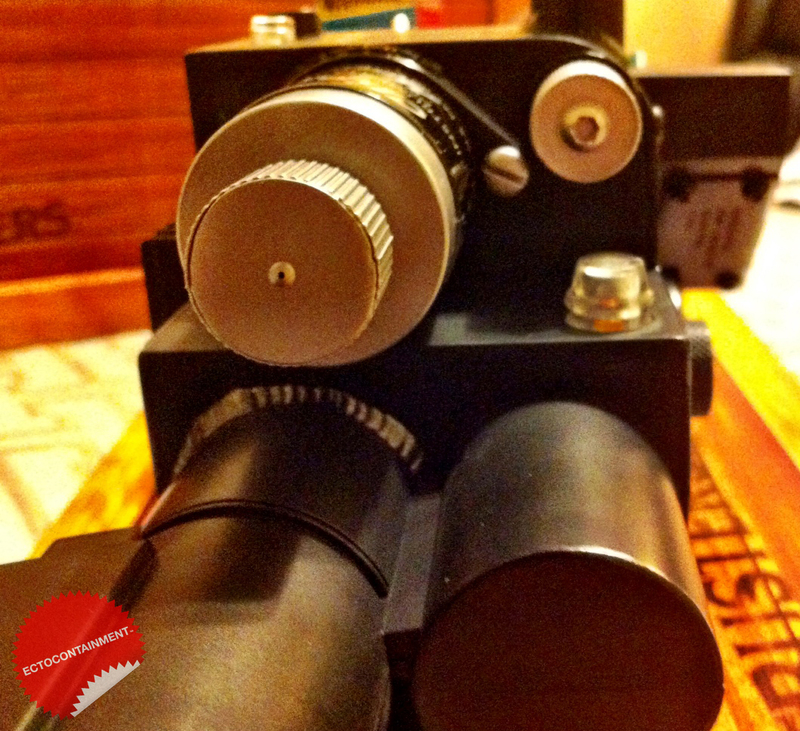 On the track, are the two screws that need to be removed for the battery compartment. Use a correct screw driver (the non powered kind) to loosen them enough to remove the track. Be careful with the nice looking, thankfully not made of plastic v hook. 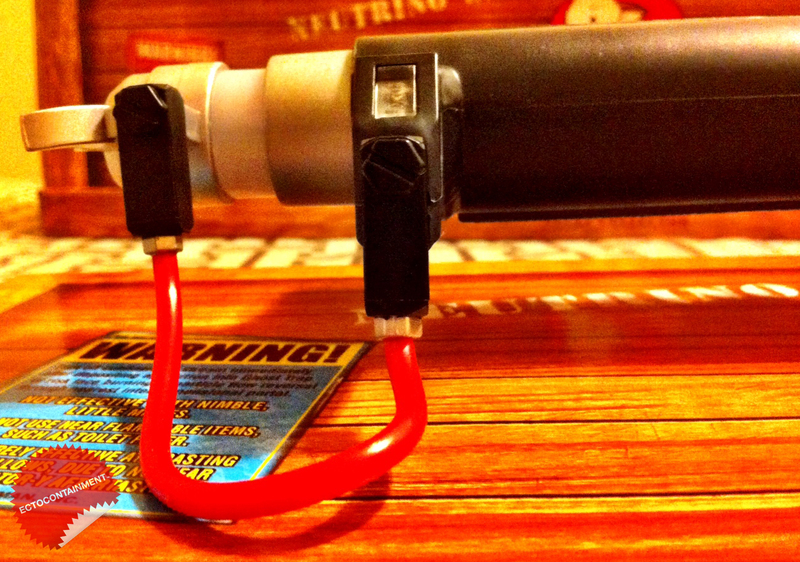 The Neutrino Wand takes 3 AA batteries. I think my old Nutrona Wand did too. I continue using Quantum batteries, a bit of added detail that may last 10 years. You can also see where the speaker is located. Replace the track, tighten screws, and we’re about to be in business with a Neutrino Wand. It may have been possible, to save battery life and the nice prop toy that was paid for in advance I think Matty/Epic (not intentionally) complicated part of the start up process. 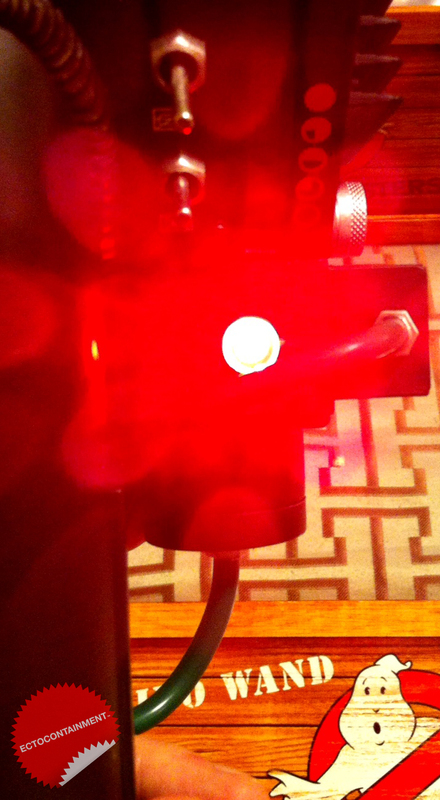 Flipping the power switch makes that bright for a photo red L.E.D come on and activates the sound effects. When you flip the proton indicator switch on, the indicator powers up, and the orange/white L.E.Ds light up. If you didn’t know the Neutrino Wand has a generator process, you do now. 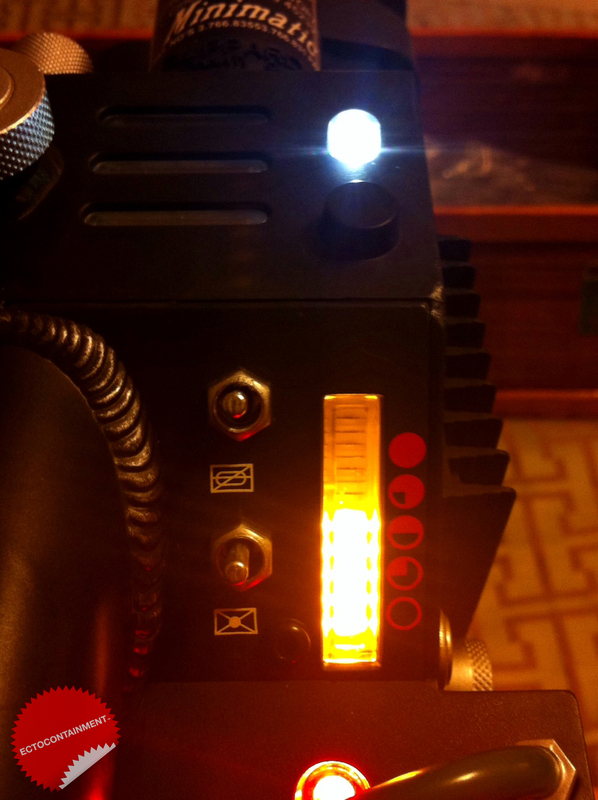 Turning the generator (Activate) switch on powers sound effects, all L.E.D lights light up, and the white L.E.D light flashes. Similar to the screen used Nutrona Wands pulling the green barrel extension lever extends the wand barrel. Pulling it again retracts it. The Neutrino Wand is now ready to bust those gghhhoooosssssttttttsssss! This is a minor complaint, in order to actually “fire” the Neutrino Wand, the trigger is the intensify button. 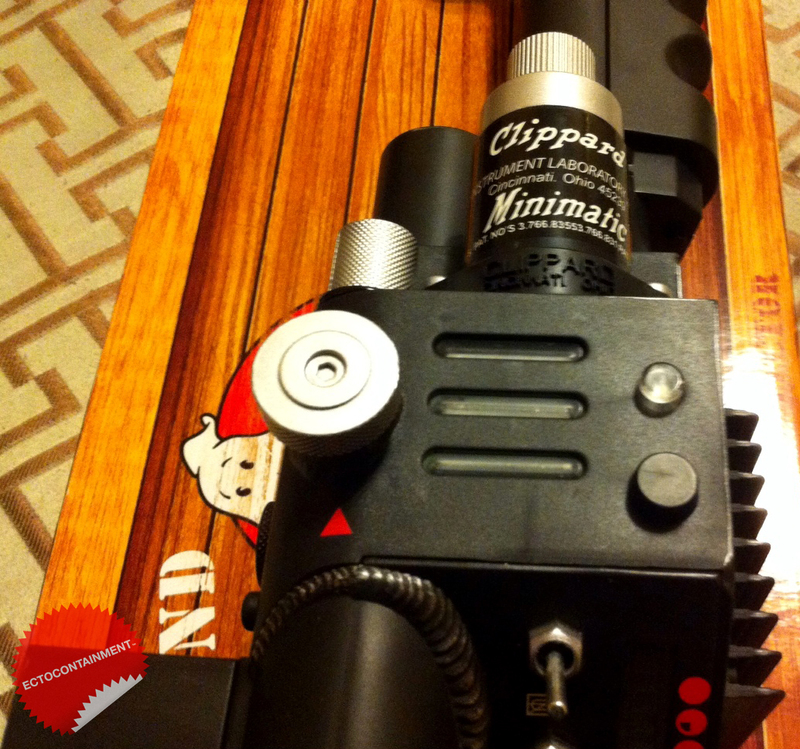 Like real and fictional weapons along with the predecessor to the Neutrino Wand, it would feel more natural if the trigger/intensify button was near the underside of the grip handle. Seems like their would be room. I know my Nutrona Wand prop replica is similar to Matty/Epic Creations. If this is how screen used ones were built, then its accurate. It’s easy enough to get use to. At “half power” the streams are a more purple and white. Its a little hard to get pictures of, you’d also see the blue “electric” arcs which are of course no way comparable to practical effects in a 30 year old movie. The Neutrino Wand will also shake. At “full power” the motor seems to really shake. I don’t know if Matty tested this, I feel like continuous use for long period of time will damage it in some way. I could also just be over cautious. “Going full stream” changes the main barrel lighting to a bright white. Again, hard to see the inside particle stream. Most people probably wouldn’t do this and I don’t think Mattel warns too curious ghostheads, when you are pressing and holding the intensify button, DON’T look into the end of the wand barrel. I accidentally did it for you, so your eyes don’t have to hurt for 11 seconds. One of the features a certain Matty Collector guru was a little too excited over was the ultimate feature of the Neutrino Wand. When its “paired” (like Bluetooth) with another Neutrino Wand, both wands can “cross the streams.” It has a built in sensor (which is a lot better then the echo locator from the Ecto-Goggles) to accomplish this. I don’t have a way to currently test this, when two ghostheads are holding $260 worth of memorabilia streams turn white, their is heavy shaking, and general mass hysteria occurs. I don’t have an exact picture for it, as Matty/Epic Creations at least has had a thought a pack could be in the future, they left a line input jack (where the split loom hose connects from the Nutrona Wand to the Proton Pack) that can play audio. 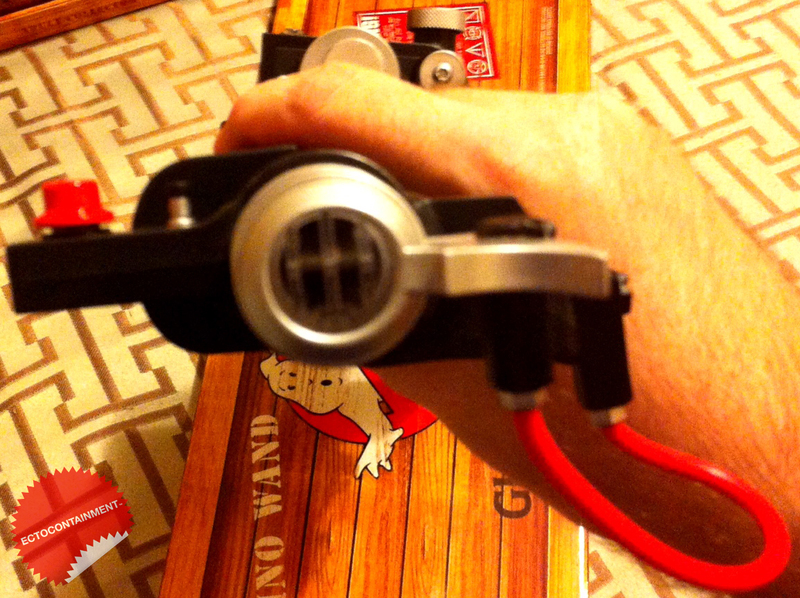 It’s possible that somehow they plan to or a ghosthead prop builder can modify it for their own pack build. Like with their P.K.E Meter, Matty Collector/Epic Creations weathered and distressed the Neutrino Wand. Because of this, some of the imperfections may have been done on purpose. 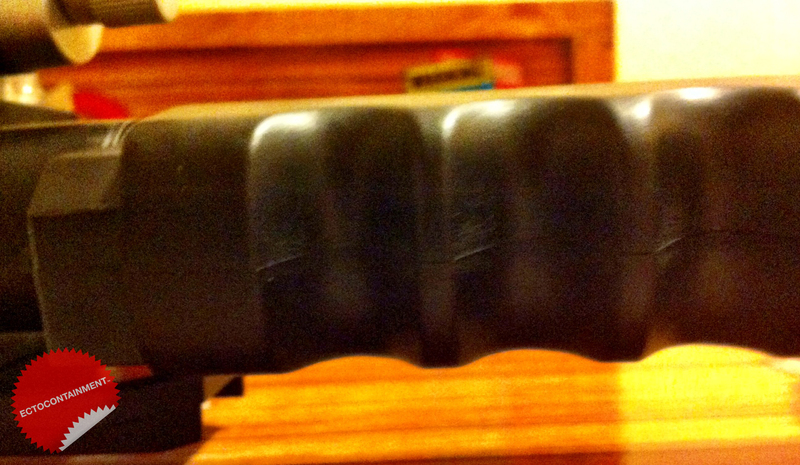 I don’t know if it can be seen with the handle grip, their appeared to be a slight dent and scratches. Even if the mark happened by accident, no one is really going to see it. I’m not bothered by it. The grips are probably hollow enough. I’m sure enough pressure could cause damage to the grips. Anyone else notice what I called a blemish in the underside of the Neutrino Wand barrel? “A couple of wavy lines.” Their’s this one area where basically it looks scuffed, they do appear like wavy lines. Again, this could have been done for normal use going into 30 years as a Ghostbuster. If you’re a collector or may need a reasonably priced Nutrona Wand with most of the necessary functions for a Proton Pack build this makes for a good starter kit. If you feel differently about these kinds of prop toys and already have or are planning to build a Nutrona Wand, then that is a better option. 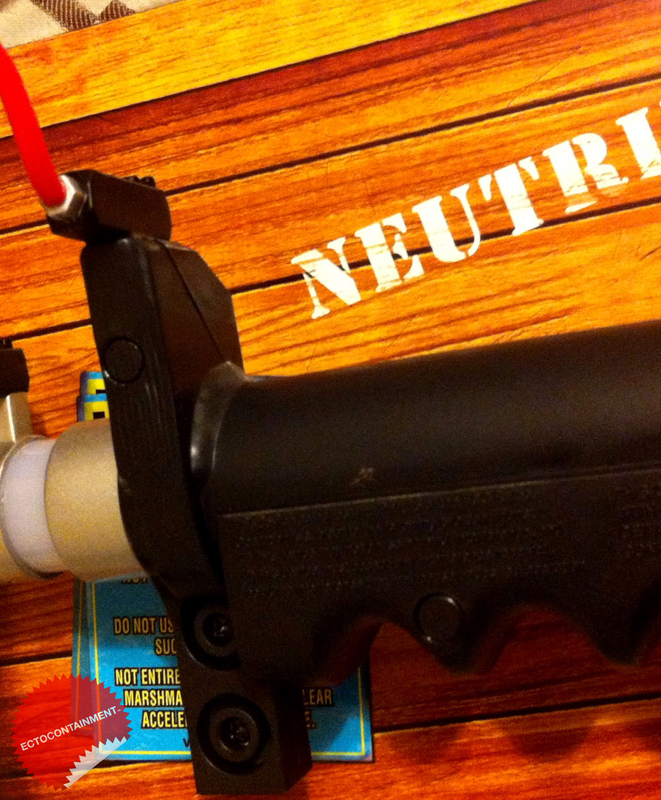 Either way kids, teens, and most ghostheads will really enjoy the Neutrino Wand from Matty Collector/Epic Creations. 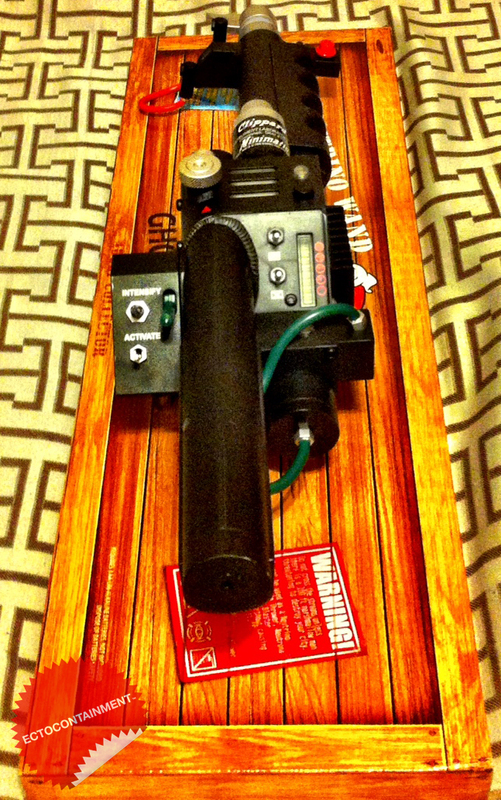 Admittedly holding this Neutrino Wand and enjoying it feels somewhat incomplete without a Proton Pack. Which ghostheads have known and enjoyed for most of our lives. It’s good Mattel may be considering one. Hopefully with the 30th Anniversary in 2014, fans will see that kind of major announcement. 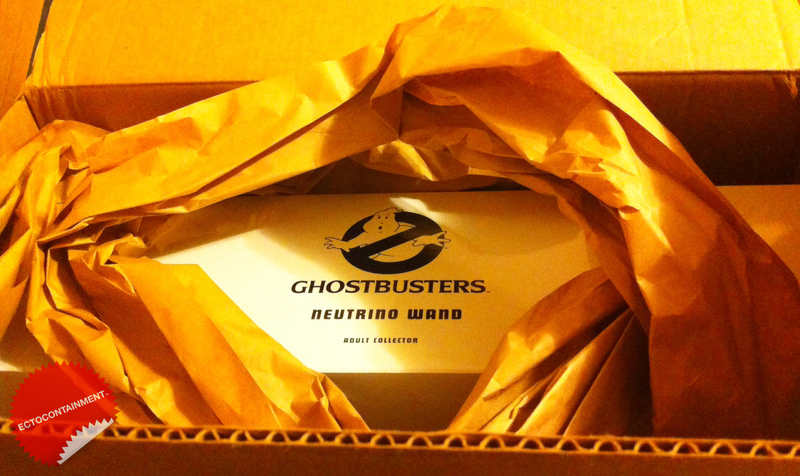 In what felt more like a Rich Collectibles (and not just Ectocontainment update) I wrote a blog post about Matty Collector and related companies sending me a second, free Ghostbusters Neutrino Wand. 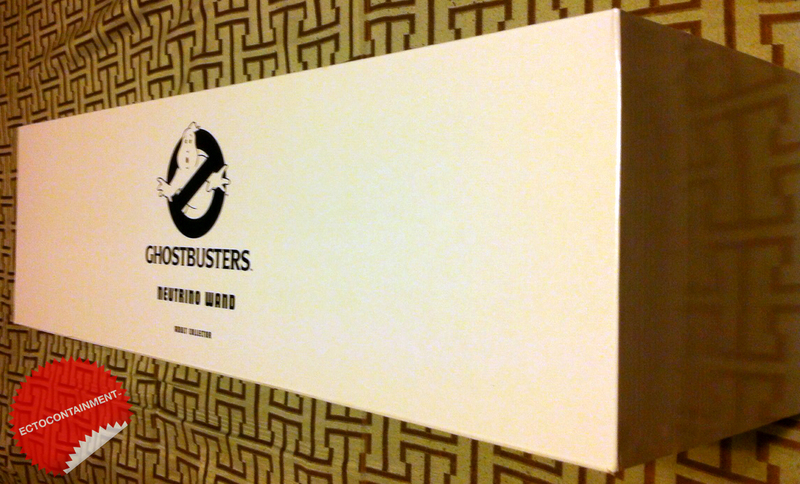 If you didn’t already know from my posting on the Ectocontainment Facebook page (http://www.facebook.com/ectocontainment) or reading my posts on Ghostbusters Fans, here’s the blog post I wrote this evening at Rich Collectibles. I want to inform you about the release of Ghost Control Inc. – We are all big fans of Ghostbusters, therefore we sat together in a team to create a retro inspired Ghostbusters themed game: Full of film references, hand-crafted 2D pixelart and of course, a lot of ghosts. If you have any questions, please don’t hesitate to ask via mail press(att)application-systems.co.uk. Not that I need another, I read today Matty Collector has “quietly” raised the price of the “Neutrino” wand by $20 to $150 USD. This isn’t a start to a bash Matty Collector conversation. Already been their in my ways and Mattel/Matty did right by me with the wand in January. Yeah, I wanted to pass “word” along that if you’re buying this directly from Matty’s site as of May/June 2014, their has been a price increase from Mattel.